In their joint statement released after the meeting, the ministers also vowed to take actions "to safeguard the region’s infrastructure, travel, supply chains and financial systems from terrorism and other illicit activities" in the wake of Friday’s terror attacks in Paris. At last year’s forum in Beijing, the 21 member economies including the Philippines — the host of this year’s forum — agreed to launch a joint study to look at the viability of a new free trade framework, called the Free Trade Area of the Asia-Pacific, and pledged to implement it "as early as possible." "We commend the progress of the implementation of the Beijing Roadmap for APEC’s Contribution to the Realization of the FTAAP," said the statement. The study will be completed by the end of next year. During the meeting in Manila, the ministers confirmed the importance of pursuing the new trade bloc based on multilateral trade schemes such as the recently sealed Trans-Pacific Partnership pact. The TPP and other trade deals are encouraging "because by having more of these regional or bilateral, plurilateral type of agreements we actually advance the position of the free-trade regimes," Philippines Trade and Industry Secretary Gregory Domingo said at a press conference after the meeting. On the Paris massacre which left 129 people dead and hundreds wounded, Philippine Foreign Secretary Albert del Rosario said at the press conference, "Everyone has expressed their condolences to the families of the victims over the terrorist acts." "There was a call for the unity of nations and people, and there was additionally a call for bringing to justice those who perpetuated the horrific developments in Paris last Friday," he said. 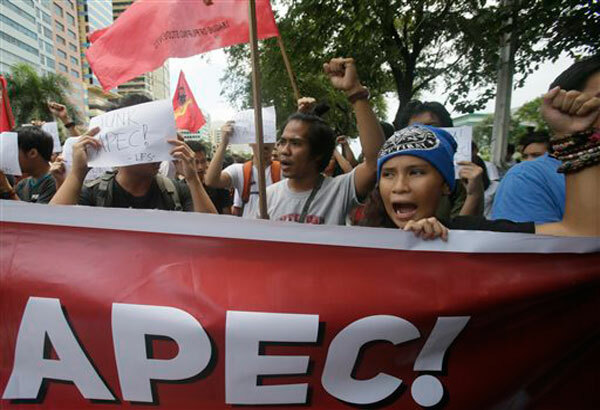 The 21 economies are considering expressing their joint response to the attacks in a declaration to be issued by the leaders later this week, an APEC source said.